First edition, second edition; it's timeless. Forty (!) years ago you absolutely had to own the fourth edition of Squad Leader, with its numerous rule changes and additions. The same held true for Third Reich, where at least the third edition, and later even the fourth edition, was a must. Internet did not exist yet, so simply downloading a new set of rules was not an option. 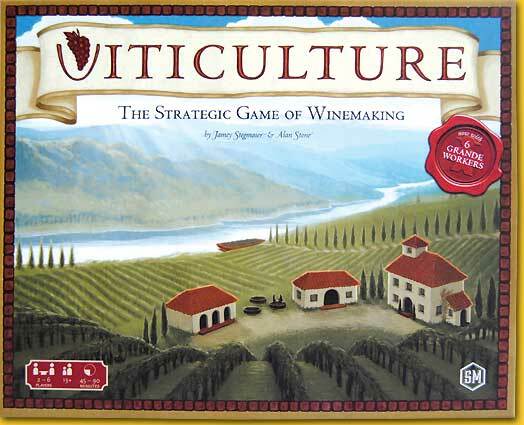 In the present-day case of Viticulture this also didn’t suffice: in addition to several rule changes, the second edition also has altered and additional material. 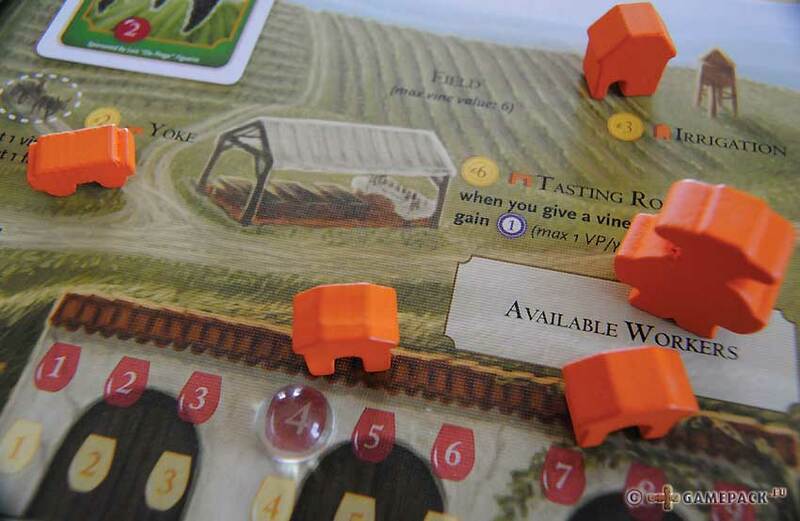 Viticulture is a crowdfunding project, and we can be grateful to the players that enabled the realisation of the first edition. However, since there are often omissions in the first edition that have to be smoothened, it is clearly wiser to wait for the second edition. If a game is really good, it will undoubtedly get a second chance, and an added advantage is that usually the price of the second edition is more friendly, due to the higher print run. 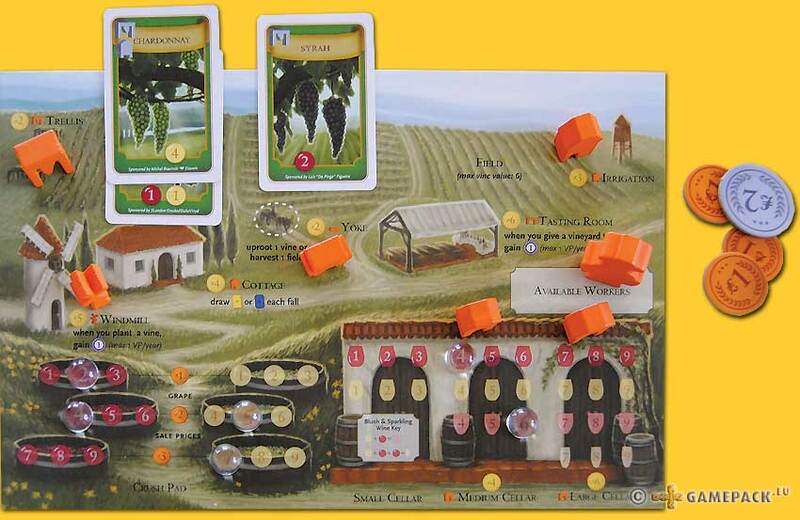 Two to six players are going to plant vines and harvest grapes, with the final aim to make wine that can be sold to customers. 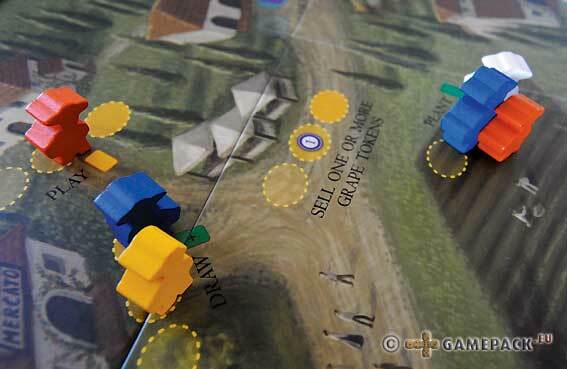 The actions are performed by worker placement; players start the game with two standard workers and one large worker. 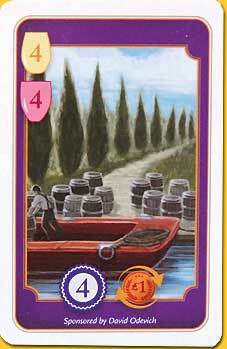 Filling wine order cards brings victory points, and as soon as one of the players has reached the 20 points mark the game enters its final phase. The current year is completed before the game is over. There is a central playing board depicting summer- and winter actions, and with enough space to accommodate the various stacks of cards. 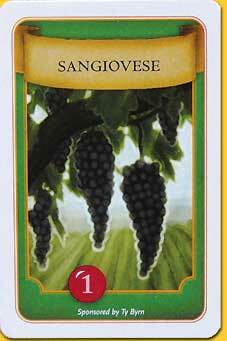 Cards involve summer visitors and winter visitors, vine cards and wine order cards. 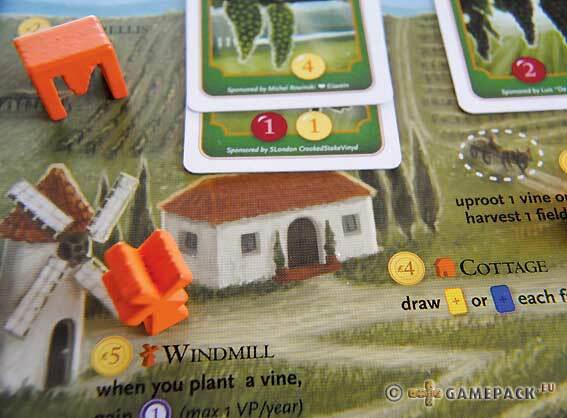 The vine cards serve to plant vines on the fields of the individual player boards, which can be harvested to obtain grapes. There are three fields available, each with a capacity of six vines. So, multiple vine cards can be placed on one field, as long as the limit of six vines is not exceeded. The first rather short season, spring, only serves to determine the player order. Players takes turns choosing what time they’d like to get up; the authors readily admit that this element was inspired by Fresko. Early birds may draw cards, late sleepers get money, victory points or an additional worker. The summer- and winter visitor cards are all favourable; sometimes money, which is indispensable for purchasing the necessary equipment, and sometimes bonus actions like an additional harvest. These bonuses can’t be claimed right away: you need to choose the action ‘play summer/winter visitor cards’, implicating that this costs you the use of one of your scarce workers..
Luckily, additional personnel can be trained at the expense of four lira. But of course it takes a worker to train a new worker. Workers are placed in turn order. They can be used in either summer or winter. This means that the players have to deliberate how many of their workers they use in summer, and how many they keep for the winter phase. In between summer and winter is a short fall-phase, which only consists of drawing either a summer visitor or a winter visitor card. 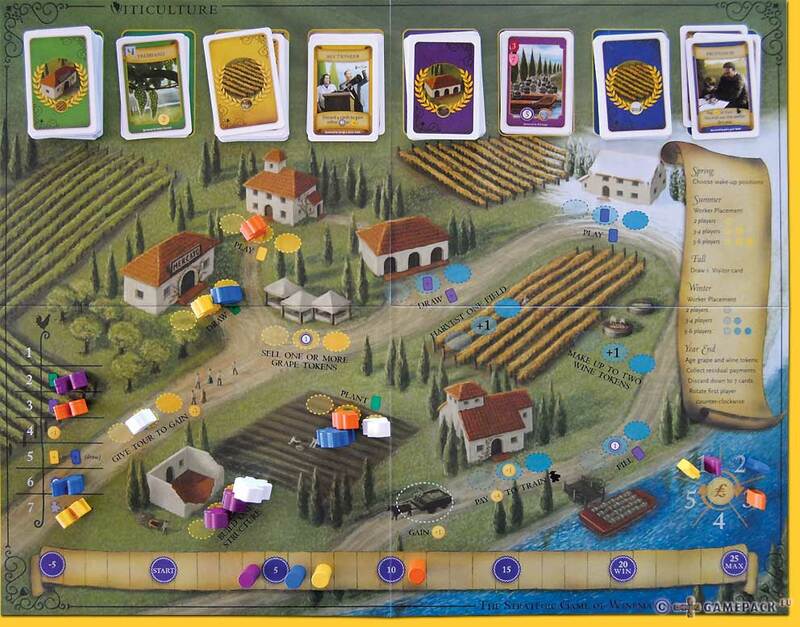 The individual player boards depict a crush pad with six barrels for crushing grapes: three for red and three for white grapes. There are also three wine cellars: small, medium and large. The players all start with a small cellar. Further away we see several structures; some of those are necessary for planting vines, others yield bonuses when specific actions are carried out. Of course all these structures cost money to construct, and there are several ways to obtain this. One is, as mentioned before, via some of the summer visitor cards. Another option is to sell harvested grapes before they are turned into wine. A third option is to give tours to curious visitors during summer. Harvesting grapes is only the second step in the winemaking process. Only after performing the winter action ‘make up to two wine tokens’ the grapes in the barrels are converted into wine in the cellars. The value (age) of the grapes in the barrels is identical to the value of the wine; in some cases several wine tokens are combined, for example to make Blush or Sparkling wine, and in those cases the values of the individual grapes are added up to determine the value of the resulting wine. Of course these complex wines are more valuable, and therefore yield more points on the wine order cards. The first step, planting a vine, requires a vine card and the corresponding summer action ‘plant a vine’. 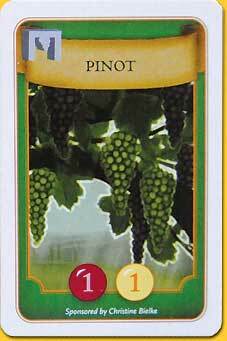 All players start with a simple Pinot card, which contains one red and one white vine. 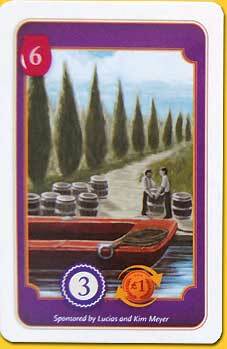 The card can only be planted after the player has constructed a wooden framework, the trellis, which costs two lira. Constructing buildings is also a summer action. Other vine cards require a water tower (irrigation) of three lira, or a water tower as well as a trellis. Harvesting the fields is a winter action, but if you own a yoke you can already harvest one field in summer. Additional advantage: the yoke is depicted on the individual player board, which means there is no competition with the other players. For all the actions on the central board, only one to three spaces are available, depending on the number of players. One of the available positions is a bonus-field. This field allows the player to perform an additional action (draw/play/plant two cards instead of one) or gain something else (1 lira, 1 victory point). These bonus fields make getting up early worth your while! But even if all positions are occupied, the large worker (second edition only!) can still join in. At the end of the year, so, when everybody has passed in the winter phase, all workers are retrieved. The roosters (!) are removed from the wake-up-list, the grape (!) is passed on to the next starting player, and all the grapes in the barrels, and the wines in the cellars increase in value by 1 (ageing). 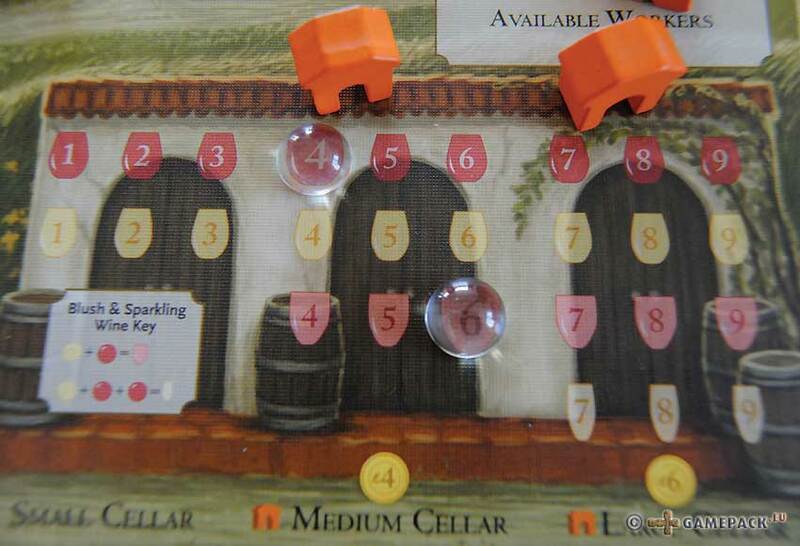 Only if the player doesn’t have the required wine cellar to accommodate a wine of a certain quality, the tokens remain in position. The exclamation marks behind ‘roosters’ and ‘grape’ have a reason: the physical appearance of the game is outstanding. All structures and wooden figures are carved from wood and painted in bright and sparkling colours. The illustrations are beautiful, although we will not go as far as to take the author’s suggestion to use the backside of the boards, which lack all the necessary supporting text. Anyway, we don’t have time to study all the illustrations: we are making wine here, understood? The actions are well divided over summer and winter; having a yoke enables the player to harvest already in summer, so he can go straight to the wine-making actions in the winter phase. 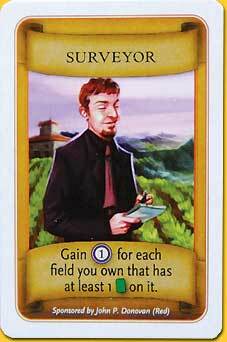 This way he stays one step ahead of his opponents, and be the first to fill a wine order card. Wine order cards score more points when more complex types of wine are involved, but these complex wines also require more work. 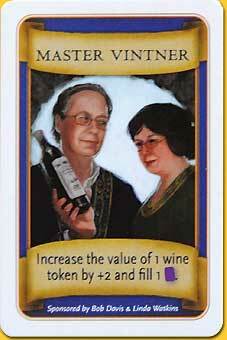 It is advantageous to have vine cards depicting several vines, but having more valuable vines also necessitates an upgrade to medium and large wine cellars early in the game. But once a player has set up his entire chain of supply, making complex wines becomes possible, and victory points will be flowing in! Unfortunately things never go as fast as expected; the game has a slow start. This is not a criticism at all; already from the beginning each player can choose his direction, and soon different approaches become visible. 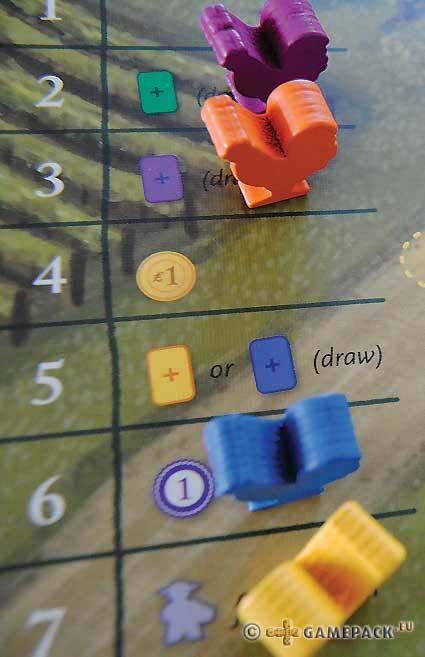 Some players start building structures, while others first draw some more vine cards to build a more balanced vineyard. A third player may start giving tours to tourists in order to earn some more starting capital. Money is very tight at the beginning of the game, but later in the game the unused coins are rapidly accumulating. Because who wants to spend five lira on a windmill that earns you one point when planting a vine? Your vine-planting-days will probably be over by then! But at the beginning of the game this windmill is so expensive that it costs too much time to collect the required amount of money. The same holds true for the tasting room which, at the cost of six lira, only gives an advantage when giving a tour. At the stage where you can actually afford this, nobody will need any more money, so nobody will be giving tours anymore… Building it early is not wise, building it late makes no sense. The fact that these expensive buildings therefore in practice are hardly ever used in the game is a point of criticism. They should have been a little bit cheaper, so people could actually use them! But all things taken together we have a beautiful game with a nice theme, and this time one without a splitting-headache-inducing complexity (Vinhos!). 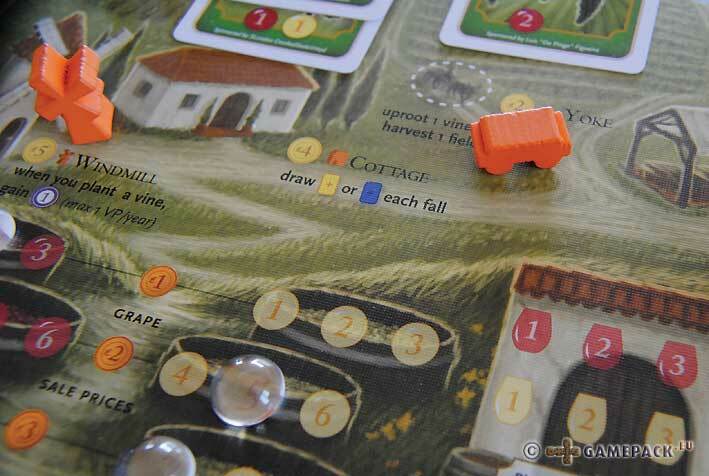 Viticulture turns out to be a little gem in the large harvest of Essen 2014!